Everyone gets to celebrate when Rocky Patel reaches a milestone and, in this case, it's his 55th birthday and commemorative Fifty-Five premium cigars. 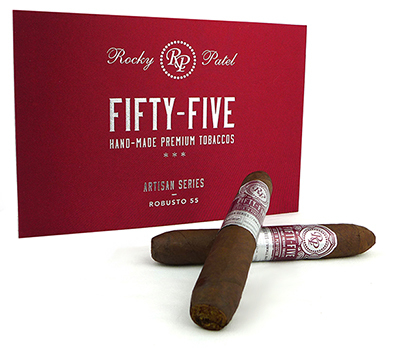 Made in Nicaragua at Rocky Patel's Tabacalera Villa Cubana S.A., the Fifty-Five is part of his new Artisan Series and showcases skillful rolling by his torcedores of 55 ring gauge cigars tapered at both ends. A rich and complex blend of Nicaraguan long-fillers and Costa Rican binder wrapped in Nicaraguan Habano leaf give the medium/full-bodied Fifty-Five cigar tons of flavor with cocoa, cinnamon, light pepper, cedar, and leather as the predominant notes.